Finding love was never so ... Awkward. Miramax Films presents the wickedly offbeat love story, Eagle vs. Shark, a funny, fractured romance between two total misfits woven into an all-consuming quest for revenge and shot through with the strange, sweet hilarity of the human condition. 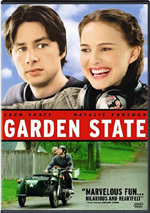 When Lily (Loren Horsley), a lonely, oddball fast-food waitress and hopeless romantic, and Jarrod (Jemaine Clement), another lonely oddball and video game clerk who has spent the last decade plotting revenge against a bully from high school, connect at a "dress as your favorite animal" party, it's a match seemingly made in outcast Heaven. But when Lily decides to risk everything for love, her hopes are nearly dashed as, after a brief fling, Jarrod dumps her because he's too busy "training" for his all-important payback mission. But neither of them can anticipate the grit the steadfastly optimistic Lily will show in her heartbreak. As Jarrod's day of reckoning arrives and everything hits the fan, Jarrod and Lily will find something that goes beyond romantic fantasies and revenge - faith in who they really are. $20.361 thousand on 3 screens. For a slice of indie comedy New Zealand style, we check out 2007’s Eagle Vs. Shark. Lonely nerd Lily (Loren Horsley) works as a cashier at a fast food burger joint. She dreams of romance and maintains a crush on sullen dork Jarrod (Jemaine Clement). However, he shuns her and she even loses her menial job. Jarrod pursues another Meaty Boy employee and invites her to his “dress as an animal” party. The object of Jarrod’s desire rebukes him, but Lily decides to make her own fate and goes to the party anyway. She impresses him with her shark costume and her videogame skills. They become a couple of sorts, though Jarrod suffers from unresolved anger. He desires to beat – and perhaps kill – his old high school nemesis Eric (David Fane). The movie follows this unusual romance and Jarrod’s path toward revenge. I couldn’t stand Dynamite, but it looks like movie gold next to the absolute disaster that is Eagle. 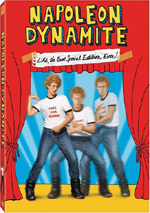 At least Dynamite had semi-originality going for it; love it or hate it, the film created something different and obviously influential. Eagle just feels like a “me too” effort without an ounce of creativity or humor behind it. This is the kind of flick that thinks it’s clever to give both its leads moles on their lips – though on opposite sides. Wow – pretty profound, huh? It’s like they’re halves just meant for each other! Cheap symbolism abounds in Eagle. You’ll find many a strained metaphor, all rendered in painfully quirky style. At various times, the live-action movie comes to a halt so we can watch stop-motion animation of partially eaten apples as they pursue their own destinies. No, I’m not joking. My life actually flashed before my eyes many times as I watched Eagle, mostly because it felt like the movie lasted my full 40 years. Man, for an 88-minute flick, it sure seemed radically longer. Every three minutes or so I would gaze hopefully at my DVD’s display with the dream that Eagle would almost be done. Alas, the time dripped by at a glacial pace. I still can’t quite believe it finally ended; that 88 minutes felt more like 880. In Jarrod, we find arguably the least likable character in movie history. He really does resemble an older Napoleon Dynamite, as both super-dorky characters boast the same absurdly high opinion of themselves. (Many other similarities occur as well – so many that if Eagle didn’t steal from Dynamite, many incredible coincidences took place.) While I didn’t care for Napoleon himself, he didn’t seem nearly this unlikable. Jarrod is truly the biggest jerk on the planet. He shows not a single positive characteristic; instead, he constantly acts selfish, self-involved, violent and emotionally cruel to those around him. And yet Lily falls in love with him anyway! Obviously the filmmakers want this to be the ultimate “love is blind” tale, and that flimsy premise is the only way a viewer could even remotely accept this tripe. Lily’s devotion makes absolutely no sense. Never do we get the slightest clue why she feels any interest in Jarrod, much less why she puts up with his nasty behavior. He’s stupid, dull, mean and not particularly attractive – and yet we’re supposed to believe that she loves him anyway. Sorry, but I don’t buy it. Lily starts out as a painfully pathetic character. Since her self-esteem is so low that she can’t imagine a mate better than Jarrod, we feel terrible for her. However, as the movie progresses, she becomes more empowered and strong… and she still loves Jarrod. When the personal growth occurs, we go from pity to borderline hatred of Lily. She knows exactly what a horrible human being Jarrod is but she embraces his cruelty and actively pursues him anyway. According to the DVD’s press release, Eagle was nominated for a Grand Jury Prize at Sundance. If this was for anything other than Biggest Piece of Crap Ever to Come from Down Under, then the folks at Sundance are idiots. Eagle Vs. Shark never amuses, charms or entertains. Instead, it angers. I’m mad I sat through 88 minutes of this intellectually and emotionally false nonsense. I’m mad the parents of those involved reproduced. I’m mad that Thomas Edison ever invented the damned moving picture because if he hadn’t done so, I wouldn’t have suffered through this painful, horrible movie. How much did I hate Eagle Vs. Shark? I hereby nominate it for The Worst Movie of 2007. I never thought I’d find a flick I liked less than Epic Movie, but Eagle did the trick. Epic was simply incompetent, incoherent and unfunny, but at least it suffered from no pretensions. Eagle comes with too much pseudo-clever baggage to be anything other than an insult to the viewer. This one goes on a short list of my most hated movies of all-time. 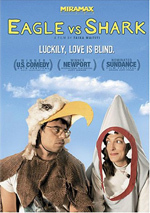 Eagle Vs. Shark appears in an aspect ratio of approximately 1.85:1 on this single-sided, double-layered DVD; the image has been enhanced for 16X9 televisions. 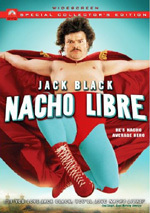 Though the movie’s transfer showed its low-budget roots, it usually satisfied. For the most part, sharpness appeared good. I noticed the occasional soft scene, but the majority of the shots came across with nice clarity and delineation. No issues with jagged edges or shimmering arose, and I also failed to detect edge enhancement. Source flaws remained absent during this clean presentation. Despite a bit of a low-key palette, Eagle kept the hues natural and reasonably vivid. Actually, they seemed to get brighter as the film progressed, which appeared to act as a cheap metaphor for our heroine's improving self-image. Whatever the case, the colors seemed satisfying. Blacks were also acceptably dense and dark, while shadows usually looked fine. A couple of shots appeared slightly opaque, but those were early and also probably acted as cinematic metaphors. (Boy, does this movie like its cheesy metaphors!) At no point did the transfer excel, but it presented a more than acceptable image. Similar thoughts greeted the Dolby Digital 5.1 soundtrack of Eagle Vs. Shark. Actually, the soundfield was a little livelier than expected, though it didn’t exactly overpower the room. Music consistently showed solid stereo imaging, though, and various elements opened up the spectrum in a satisfying manner. Environmental pieces manifested themselves well across the front, and the surrounds bolstered this material in a nice way. No, it didn’t sizzle, but it seemed pretty good. Audio quality was also fine. Speech seemed natural and concise, while effects – modest though they usually remained came across as clean and accurate. Music showed good range and vivacity throughout the movie. The soundtrack suited the film. A few extras fill out the package. We open with an audio commentary from writer/director Taika Waititi and actors Loren Horsley, Joel Tobeck and Craig Hall. To start, Waititi talks to Horsley on the phone, but she has to split about half an hour into the proceedings. Tobeck then shows up in the studio and chats until very close to the film’s conclusion. At that point, Horlsey comes back on the phone and Hall replaces dshakjdas in the studio. The format sometimes makes the commentary awkward because Waititi has to describe the onscreen action to Horsley. This turns a lot of it into narration. When the director doesn’t simply tell us what we see, he frequently praises the flick or tells us the names of actors. Those who’ve heard commentaries from the Farrelly brothers will recognize the pattern; like the Farrelly boys, Waititi cast lots of friends in the film, so he makes sure we know that. At least Waititi shows self-recognition of this and tries to avoid it. Nonetheless, we don’t get a lot of good content in this commentary. We learn a little about sets and locations, cast, characters and performances, the script and various concepts, but the package doesn’t add up to much. It improves when Horsley departs simply because the narration factor subsides. Overall, the commentary has its moments and will provide a modicum of insight, but don’t expect a ton of good information. 13 Deleted Scenes run a total of 15 minutes and one seconds. These include “Working Out” (1:13), “Bottle Throw – Part 1” (0:35), “Lily Plays Guitar” (2:24), “Jarrod Visits Tracy” (1:36), “Lily In the Tent” (1:37), “Jarrod’s Phone Call” (1:08), “Hitchhiking” (0:58), “Bike Date” (0:31), “Jarrod Throws Stars” (1:48), “Lily the Morning After” (0:55), “The Fountain” (0:54), “Dream Sequence – Previsualization” (0:59) and “Bottle Throw – Part 2” (0:19). Proof that I’m devoted to this site’s readers: the fact I sat through 15 minutes of additional footage related to Eagle. Did anything here change my mind and make me think the film wasn’t abominable? No – it’s more of the same quirkiness and inanity. It didn’t enable more rage in me toward the flick, but I think I was already at 100 percent. Fans will be interested to see more about the Jarrod/Tracy “relationship”, though, as some scenes flesh out that side of things. We can watch these with or without commentary from Waititi. He tells us a little about the scenes, though he often just describes them. Unfortunately, he often fails to let us know why he cut them, so we don’t learn a lot about that side of things. Next we get two minutes and 47 seconds of Outtakes. This consists of standard blooper reel material. Folks goof up and giggle. Yawn. In addition, we find a Music Video for “Going Fishing” by the Phoenix Foundation. It presents many quirky movie clips over a quirky song. A few shots of the band as they make a quirky trip pop up as well. It’s all very… quirky, and not even remotely interesting. The DVD starts with some ads. We find promos for Blu-ray discs, WALL-E, and Gone Baby Gone. These also appear in the Sneak Peeks area along with clips for Becoming Jane, The Golden Door and No Country for Old Men. No trailer for Eagle shows up here. Want to know how I can tell just how much I loathed Eagle Vs. Shark? Just looking at the DVD’s menus nearly sent me into a fit of rage! Some folks enjoyed this insulting, idiotic claptrap, but I can’t fathom how that was possible. An hour after the flick ended, I’m still actively angry about what I saw. The DVD gives us perfectly acceptable picture and audio as well as mediocre extras. If you must buy a copy of Eagle, please do so simply to destroy the DVD and eliminate this plague from the earth. This is one of the worst films I’ve ever seen.